Mary Kim and her team craft this set out of oak and walnut using wood harvested from Mary's family farm. When it comes to hosting, what's your angle? 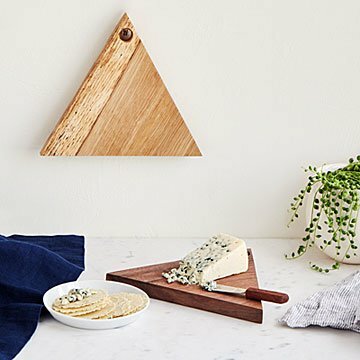 If it's modern meets minimalist, then this geometric cheese board duo is your jam (which pairs nicely with brie). Mary Kim and her team craft the set of two out of oak and walnut using wood harvested from Mary's family farm in Watts, Oklahoma. Combine them for a cocktail party, or use just one to fix yourself a sophisticated snack. Each features a hole for easy hanging. Handmade in Siloam Springs, Arkansas. Mary Kim is an entrepreneur who decided to follow her dream and open an artisanal woodworking boutique. All of the wood used there is grown on Mary’s family's farm in Watts, Oklahoma, where it’s sustainably harvested, hand-milled, and dried in a solar-powered kiln. Mary lives with her husband, Will, and their beloved Husky, Finn, in Siloam Springs, Arkansas.